These are the ingredients I start with every time I make dressing. 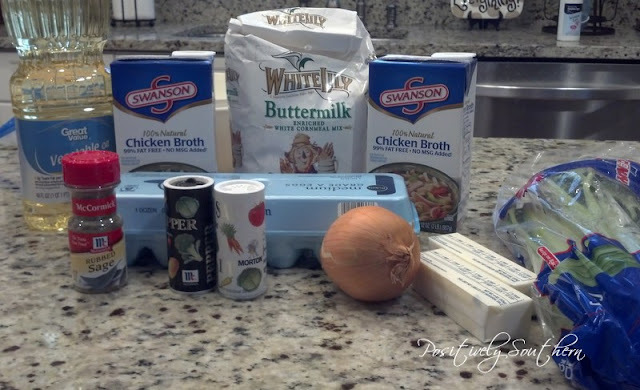 In addition to these ingredients I use 5 slices of white bread, any brand. 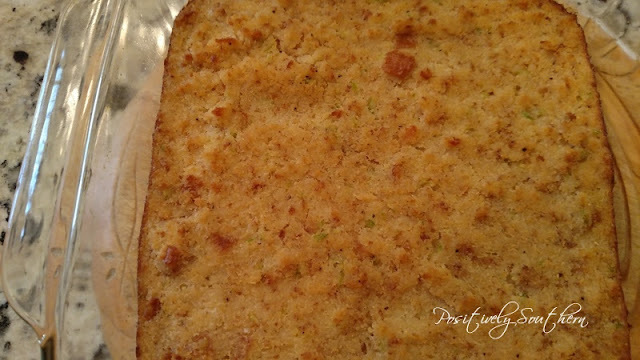 I follow the instructions on the bag of White Lily Buttermilk Cornbread for how to make cornbread. 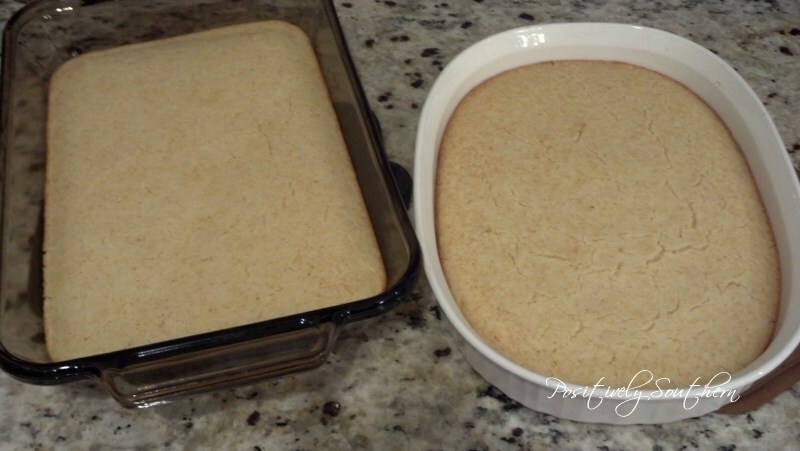 I make 2 making of cornbread so I have plenty of cornbread. I do not use buttermilk but just regular milk, we use 1% milk and this is what I use. 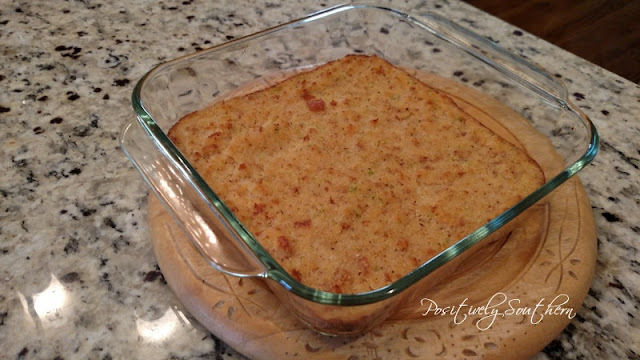 Feel free to bake the cornbread in whatever you like, just pour it in a dish so that it can be thin. This makes crumbling it easier when you do this later. While the cornbread is baking I chop up 1 cup of onion and 1 cup of celery. To chop it I've used just a knife, a food processor but recently I bought a Pampered Chef chopper I like so now I use it. As soon as the cornbread is cool enough for me to crumble I begin this process. I want it to be really fine so I am careful to not have chunks of cornbread in the bowl. Just for the record I use a really large Tupperware bowl to make dressing in so it is easier to work with. 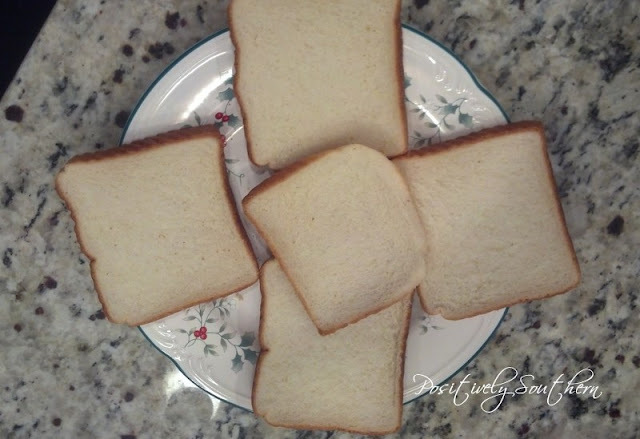 After I crumble the cornbread, I also crumble the 5 pieces of white bread into small pieces that will dissolve as I pour the chicken broth in. To get the bread to crumble better I lay the bread out over night uncovered and this works pretty well. Sometimes I have just laid it out first thing in the morning I plan to make my dressing. It should look like this! After the cornbread and bread is crumbled, slowly add the first carton of chicken broth. I use the entire 1st carton of broth. Begin to mix with a big spoon stirring as you pour the broth. By looking at the photo below you can tell that you will need more liquid but don't add the 2nd carton of chicken broth just yet. Now I add a pinch of sage, sprinkle about 1/4 teaspoon of black pepper and then I use my salt shaker and just shake a bit of salt and stir...I taste at this point....I taste the mixture and see how much more it might need but, if I had to guess I use about 1 1/4 teaspoon of salt. 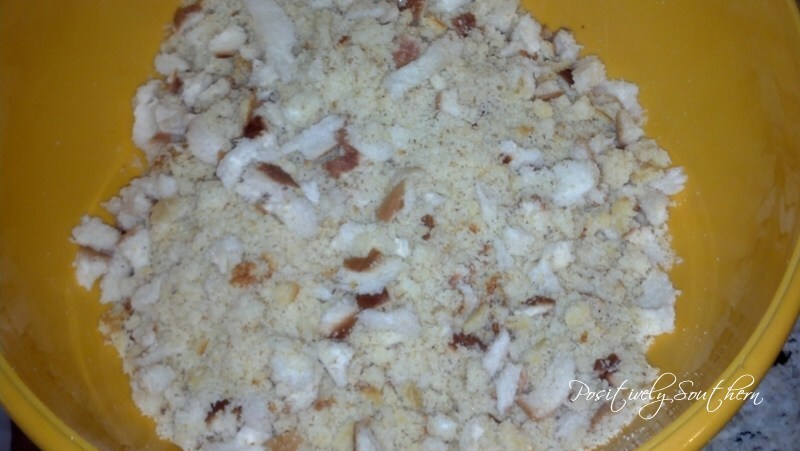 Do not taste the raw dressing once you add the eggs! 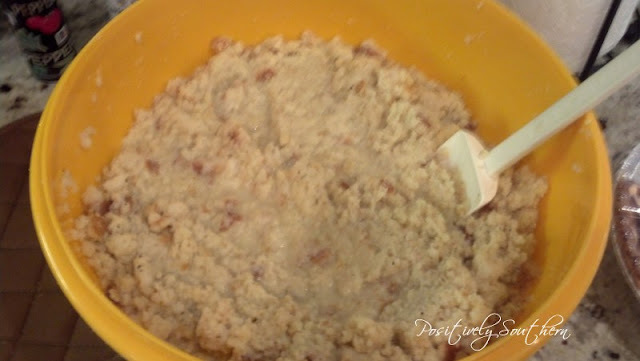 Add 2 medium eggs and stir into the mixture. 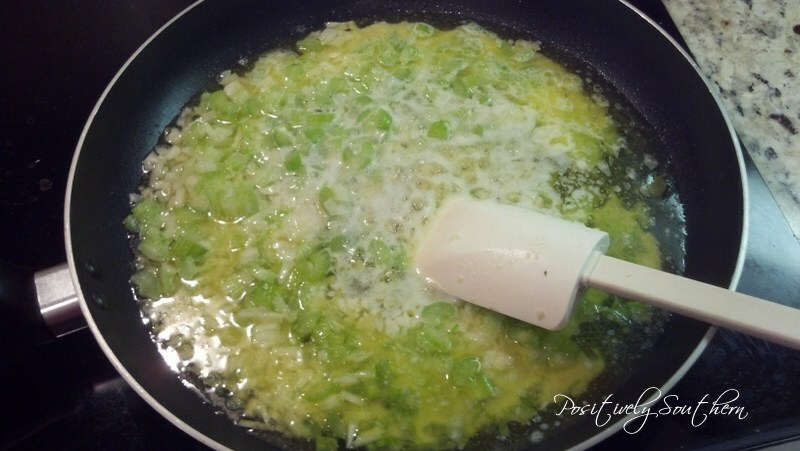 In a frying pan/skillet combine 2 sticks of butter(yes real butter) and onions/celery. 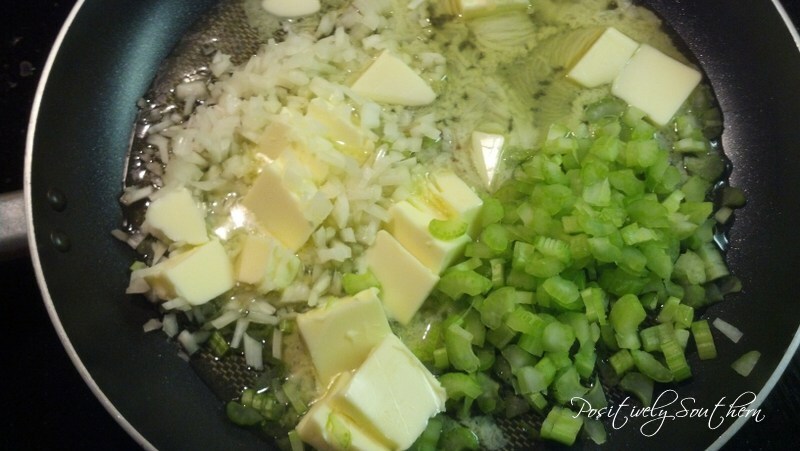 I chop up the butter and begin to melt it with the onion and celery already in the pan. Stir often and cook until the onions are somewhat translucent. 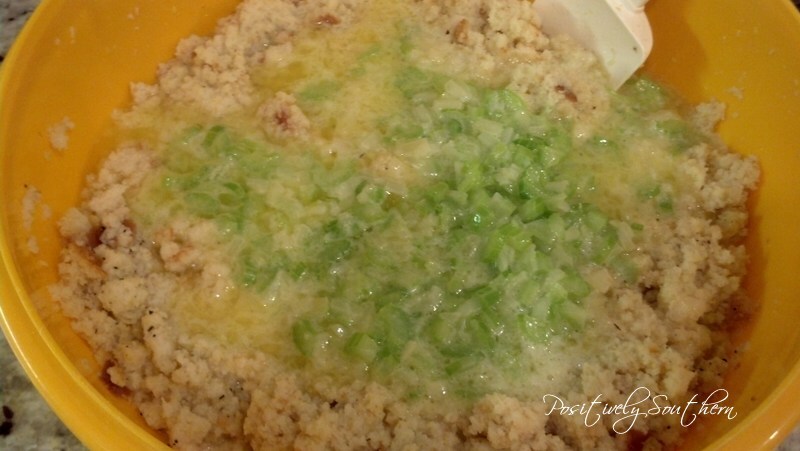 Some people omit this step but I find that it infuses the celery and onion to the butter and it has more flavor and the vegetables are more tender this way too. Next up, I pour this into the bowl with the cornbread chicken broth mixture. After stirring the melted butter, onion and celery in the cornbread mixture I slowly begin to add the next carton. You will not use the entire carton. When the mixture is a somewhat soupy but not totally liquid it is ready to bake or freeze. You read that right! At this point I usually pour the uncooked dressing into freezer containers that will hold exactly what I will need on Thanksgiving or Christmas. 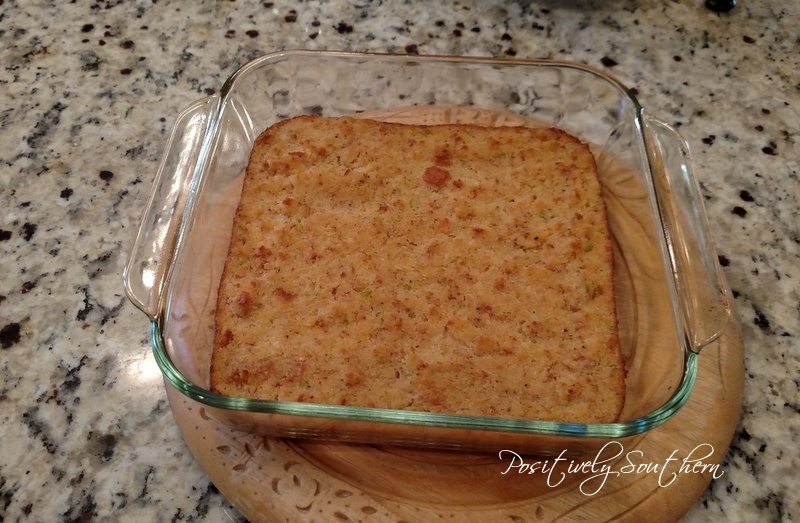 By mid October I have always made the dressing we will use for Thanksgiving and Christmas. It freezes amazingly well! 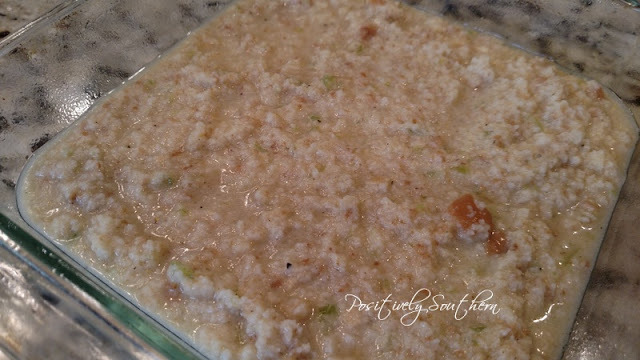 To thaw, I usually sit the frozen container in my fridge about 2 days prior to baking. This pic is what it looks like when I pour it into a greased baking dish. To bake I preheat oven to 350 degrees and bake for about an hour. Sometimes I want it a little more brown so I add a few extra minutes to baking. * A side note* After Aunt Jean taught me to make her dressing, I invited her and Uncle Carl along with my inlaws over for a Christmas Eve meal. I served her dressing, she looked across the table at me after taking a bite and said "girl I think you've nailed it" no doubt that was the ultimate compliment for me! Tamyra, I'm going to try your recipe this year. 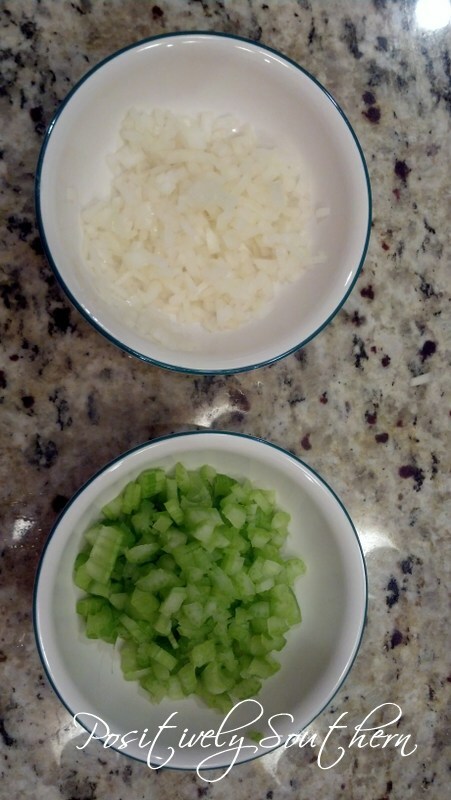 I've never put the white bread in mine nor have I cooked the onions and celery before adding them to the mixture. I can't wait to taste it! Have a wonderful Thanksgiving!